Transport Minister Andrew Jones today hailed the significant investment by UK companies in electric vehicle fleets at a business summit in London yesterday. Company bosses were praised for adopting ultra low emission vehicles (ULEVs) at the Future of Business Mobility summit, which was hosted today by the government-backed Go Ultra Low campaign. Transport Minister Andrew Jones urged those companies to remain “ambitious and bold” in embracing plug-in vehicle technology, and spearheading the development of this growing sector of the UK car market. Analysis by Go Ultra Low* shows 20,992 ULEVs were registered between January and September this year, growth of 138.5% against 2014. More than 64% of these registrations were made to UK businesses, highlighting the important role that companies play in new car purchasing. During the first nine months of 2015, ULEV market share grew to just over 1% of the market. 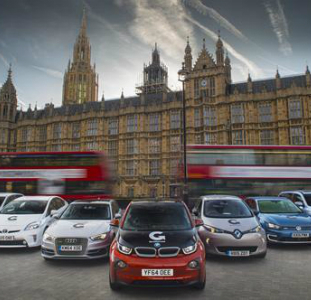 Government anticipates that 5% of new car registrations (around 100,000 units) will be ultra-low emission by 2020. The potential higher list price of electric vehicles, when compared with conventionally powered cars, is more than offset by other benefits; fuel savings of up to 10p per mile, an estimated 20-30% saving in service, maintenance and repair costs and Vehicle Excise Duty and Class 1A National Insurance benefits. Data from Lex Autolease, the UK’s largest vehicle leasing and fleet management company, reveals that running a BMW i3 over four years/60,000 miles will deliver a potential saving of £58 a month over rival, non-electric models – that’s £2,784 over a four-year operating cycle. Multiply that by a fleet of just 10 cars and the savings escalate to almost £28,000 over four years. Similarly with the Nissan LEAF, the monthly savings compared with the conventionally aspirated competition are £105 a month. That equates to more than £5,000 over a four-year operating cycle and £50,400 on a fleet of just 10 cars. The financial benefits of ULEVs are also available to company car drivers, of which there are approximately 940,000 in the UK. In addition to the 8-10p per mile fuel savings for those paying for their own mileage, business drivers can save themselves more than £6,000 in benefit-in-kind company car tax over a five year period by going electric. There are 27 pure electric or plug-in hybrid cars and nine vans, now available to buy in the UK, with the variety of vehicles ranging from high-performance sports cars to capable models ideal for business use. Go Ultra Low exists to help businesses and motorists understand the benefits, cost savings and capabilities of these vehicles. The collaborative campaign is the first of its kind, bringing together a consortium of seven leading vehicle manufacturers (Audi, BMW, Mitsubishi, Nissan, Renault, Toyota and Volkswagen), Government and the Society of Motor Manufacturers and Traders (SMMT). A business guide to plug-in vehicles was published today by the Go Ultra Low campaign and is available to download from www.GoUltraLow.com.